From my first day serving as an AmeriCorps member at the American Red Cross at Joint Base Lewis-McChord, I have been able to play a hands-on role in program development and management for services that are offered to military service members, veterans, and their families. One of these services includes our outreach programming at our local Veterans Affairs hospitals and Washington State Veterans homes. 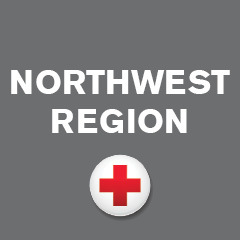 For our region alone, I, along with fellow AmeriCorps members and American Red Cross staff, help to maintain outreach programs in 3 VA hospitals located in Seattle, American Lake, and Spokane, along with 4 WA State Homes located in Retsil, Orting, Walla Walla, and Spokane. Prior to AmeriCorps members joining the Service to Armed Forces team at the American Red Cross, many of these outreach programs were solely being maintained, not expanded. There was one place in particular, the WA Soldiers Home in Orting, WA that I noticed had a large room for growth! There was not a consistent outreach program that occurred routinely at this location, unlike our other WA State Homes. After this realization, I was very thankful to be given the opportunity to create one! I decided to plan a “Healing Arts” activity that veterans, no matter their artistic, physical, or mental ability could participate in. I recruited volunteers to prepare 20 painting canvases with different designs made out of masking tape on each canvas. When the veterans painted the canvas, the design under the tape would remain white, creating a colorful artwork when the tape is pulled off. The designs ranged in everything from sailboats and cats, to geometric designs! On the day of the activity, I recruited and trained volunteers on the activity and we went to Orting to lead the event. The veterans in attendance had a blast painting their canvases and enjoyed being able to create a masterpiece without needing “artistic talent” or having to worry about physical factors, such as arthritis or loss of vision, prohibiting them from painting. Since this activity, American Red Cross volunteers have been back to the WA Soldiers home to help paint lighthouses and we are planning an event for fabric painting at the end of this month! I enjoyed being able to see an idea of my own go into fruition and to serve alongside American Red Cross volunteers and fellow AmeriCorps members to create an ongoing, and volunteer sustainable program. However, I am most proud of being able to implement a program that brought joy to veterans and left them with a sense of pride and accomplishment, despite whatever internal stresses that they may be struggling against. It truly puts a perspective on what an honor it is to be serving those who have served.